Brazil’s favelas are dense with colorful, unconventional architecture. These sprawling hillside neighborhoods were first built around major metropolitan areas by displaced soldiers in the late 1800s, then continued to grow organically as rural Brazilians migrated to urban areas. The houses are built from low-cost or found materials over the course of generations, making a hodge-podge of architectural style and color. 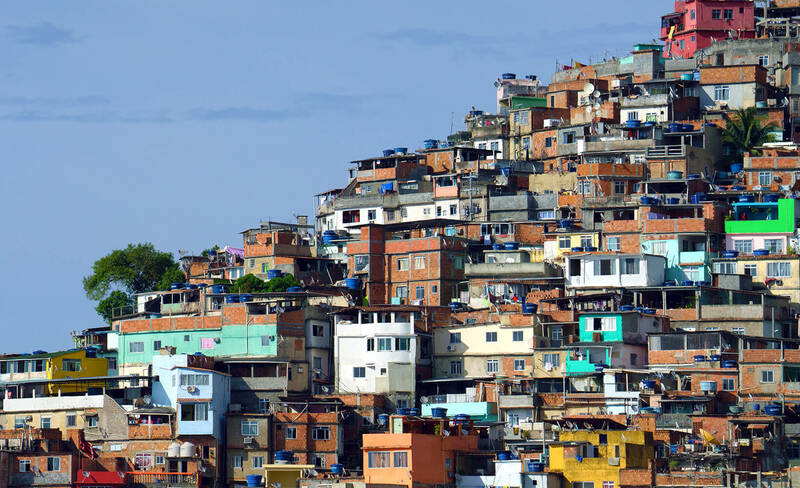 It’s not surprising that such an environment inspired designer Matthias Buehler of vrbn.io, an urban planning consultancy firm, to create a scale model of a fictional favela with Esri’s CityEngine urban planning software. “I had seen a favela once in southern Brazil,” says Buehler, “and I liked the combination of topography, dense vegetation and maze-like architecture.” Buehler, along with fellow artist Cyrill Oberhaensli, first built the CityEngine model in 2014, and recently gave it a fresh update for real-time rendering with Unreal Engine. 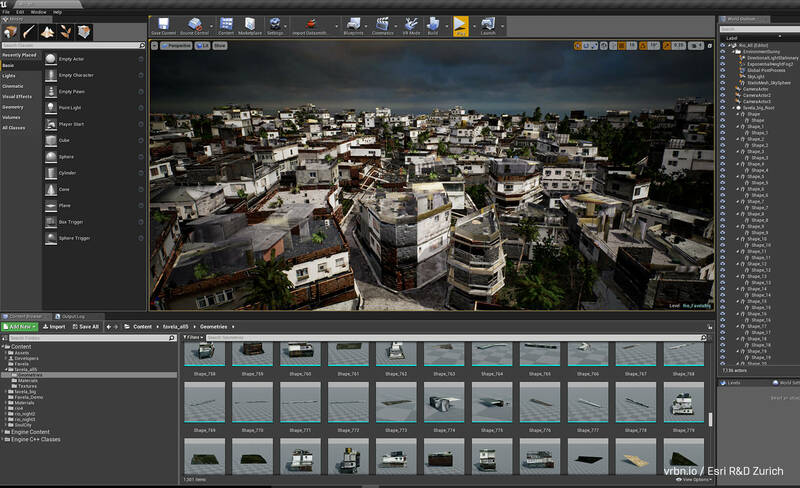 The favela model was exported to Unreal Engine via Datasmith, the CAD transfer tool in Epic’s new Unreal Studio. Datasmith reads the files exported from CityEngine and converts the entire scene for an optimized result in Unreal Engine. Epic first showed the integration of CityEngine and Datasmith at Siggraph 2017 when they worked with Esri and HOK (a well-known global design, architecture, engineering and planning firm) to create a demo of CityEngine and Unreal Engine, but wanted to use the favela project to push Datasmith’s capabilities even further. CityEngine uses custom scripts (called rules) to lay out a neighborhood and populate the scene with procedural streets and buildings. CityEngine rules can control the size and appearance of buildings, streets, sidewalks, and foliage, and the distribution of other urban elements like telephone lines and trash cans. Materials can also be rule-based. Buehler prepared a number of textures for different types of facades, and used rules to combine and apply the textures based on building dimensions and other factors. Colors and even distress, cracks, and dirt can also be varied using rules. Because building is always ongoing in a favela, loose building materials and tools are often lying around. Incidentals like pallets, bricks, buckets, and trash bags were created as low-poly models in Autodesk Maya and Maxon Cinema 4D. 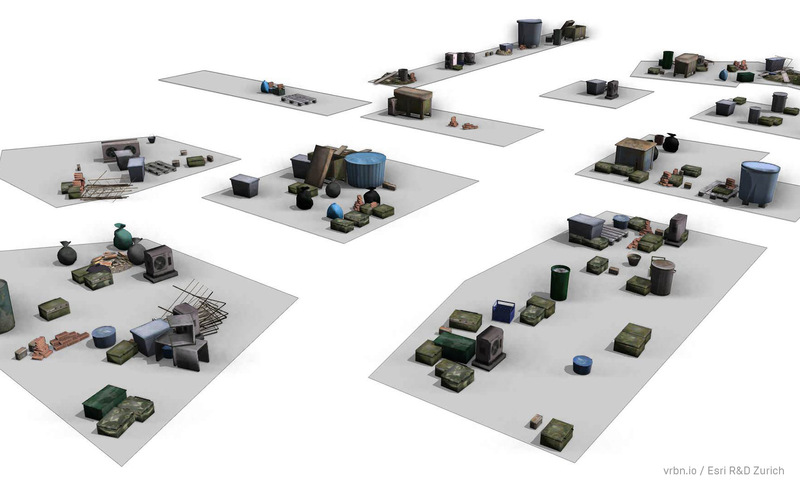 After importing the models to CityEngine, the models were instanced and distributed using custom rules. When all models and instances were in place, the scene topped out at about 150 million polygons. In the first version of the model created in 2014, Buehler reduced the total number of materials in the scene by reusing them where possible. 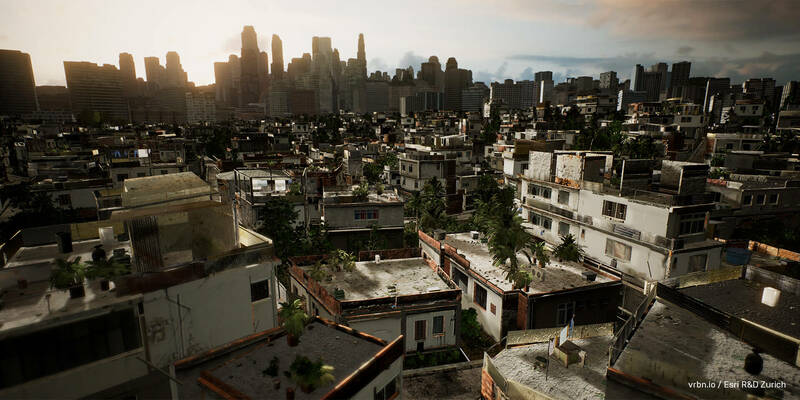 In his 2014 video about the first favela model, he included a few stills rendered with Maxwell Render. Even with material reduction, each frame took 10-40 hours to render. This is an insurmountable barrier to experiencing the design—it needs to be interactive to reach the goal of an “experience”. 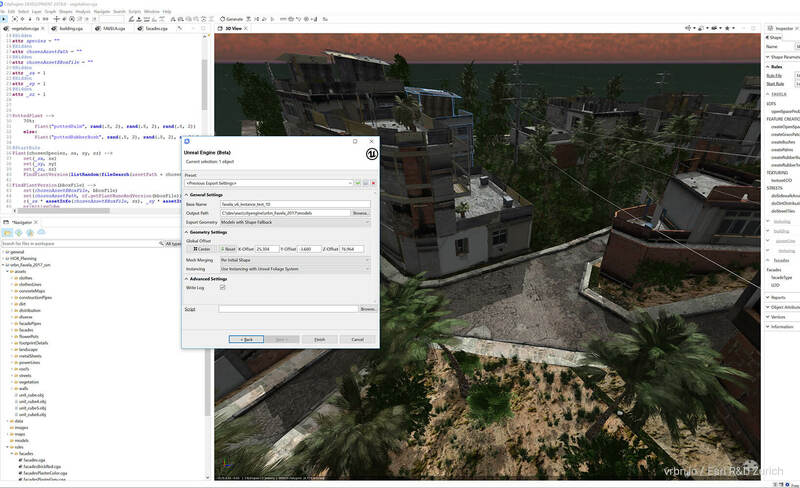 Datasmith for CityEngine natively provides optimizations that facilitate real-time playback within Unreal Engine. Instanced CityEngine elements like foliage can easily send poly counts sky-high when treated as individual objects during export. The Datasmith exporter takes CityEngine instances and translates them to Unreal Engine instances, reducing memory usage and optimizing real-time playback. 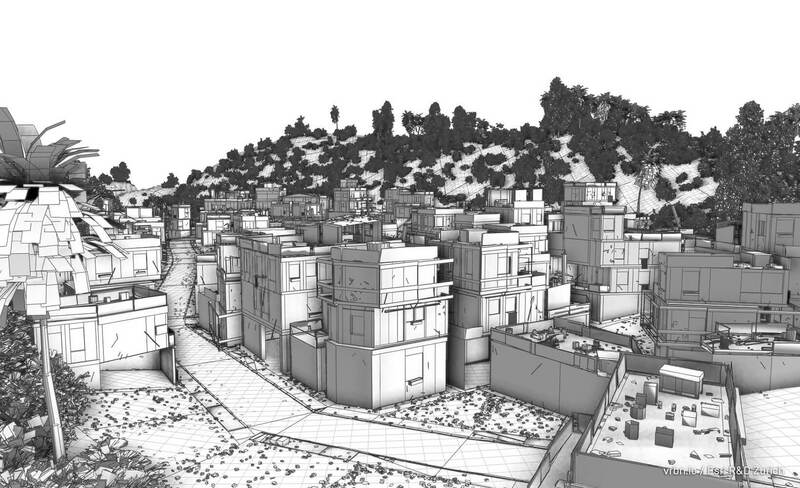 Models imported to CityEngine and distributed as instances, such as loose building materials, A/C units, and trash cans, were also converted to Unreal Engine instances by Datasmith. “During the beta period, we worked directly with Esri to improve Datasmith,” says Pimentel. He adds that Esri was the first partner Epic worked with on improving the API, and that during iterative testing they improved export speed by more than 10x. Once the scene was imported to Unreal Engine, Benjamin Neukom, Software Engineer at Esri, made a few adjustments to materials and lighting. Since only a few materials in the favela model are reflective, he was able to use Screenspace Reflections rather than Reflection Captures. Neukom used dynamic lighting rather than baked lighting “because we wanted fast iterations to get a good feeling for the overall mood of the scene.” To give the impression of light shining from the windows of background buildings, Neukom saved the expense of using actual lights by using an Emissive Mask to cause high-intensity pixels on these buildings to glow. Epic and Esri see the recent release of Unreal Studio, a suite of plug-ins, templates, and training on the CAD-to-Unreal pipeline, as an important step in the rise of real-time rendering in the architectural visualization space. He adds that the improvement in real-time engines has been a driver for this evolution—with real-time rendering, you get the possibility of immersive experiences. The rapid adoption of Unreal Engine, shown in a recent CGArchitect survey, is evidence of this trend. Although VR isn’t yet mainstream for urban planning, “the interest is there. It’s just been difficult to get the complex data into a real-time engine without a lot of data preparation, but we’ve now tackled that issue with Esri,” says Pimentel. “Real-time rendering opens up the possibility of bringing people together in a collaborative environment to better understand design. We’re breaking down the barriers one by one, and opening the door to an interesting future.”. Ready to try Unreal Studio? Download the free beta here.